I caught a little grief for my Transformers review...but I stand strong as a uber-TF-fan and I ask for no forgiveness. I say there is nothing wrong with a film that plays to the teenager-tweenager in us, and while Transformers has some aspects that is geared towards mature, adult viewers, it was mainly is a fan-fricken-tastic nostalgic trip into the days of my youth. There is nothing wrong with that. Nothing. I will never ask for forgiveness for my indulgences and I stand by that my maturity as a filmgoer is beyond reproach. So there. Nah nah nah nah nah neeeee nah. Speaking of maturity as a filmgoer, how about that Larry Crowne. Tom Hanks...Julia Roberts...nothing screams adult audience, like Tom Hanks and Julia Roberts!!! 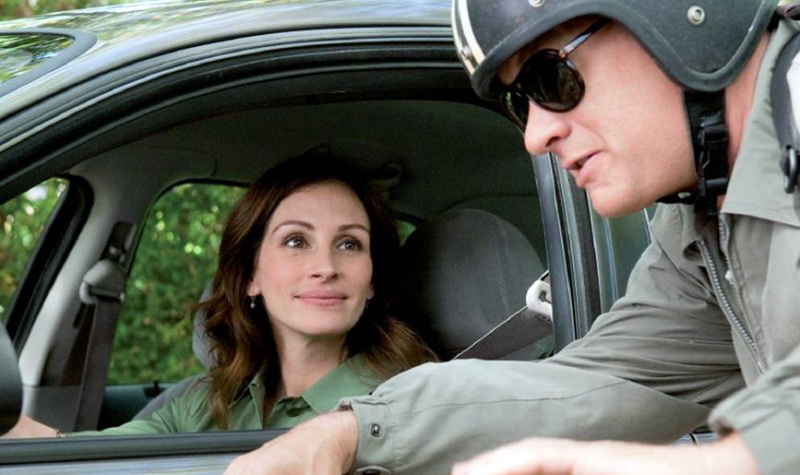 Larry Crowne is the second feature directorial effort from Tom Hanks. I think this movie very much falls into the category of a vanity project...Tom Hanks made this funny, all-around enjoyable film, just because he could. He co-wrote the flick with Nia Vardalos, who he formerly paired with in producing Vardalos's breakout hit, My Big Fat Greek Wedding. I find Tom Hanks to be one of the all-time most watchable actors and this effort is no different, you see, as Hanks is both director and star of Larry Crowne. And what is wrong with all of this? Absolutely nothing! I'll take all the Tom Hanks I can get. Membership has its privileges as along for the ride here is Julia Roberts, who plays Mercy, ne Mercedes Tainot, the troubled Professor who leads the speech class that Larry enrolls in as he embarks on his new role as college freshman. The message at the outset of the film is bleak: Larry, a Navy man, is laid off for not having a college degree preventing him from advancing through the ranks at the retail outlet where he is quite clearly the most proud and most knowledgeable employee in their ranks. Twenty years in the Navy...around the world in the school of hard knocks should count for something, but not so as otherwise we wouldn't have a flick. Early on we have cameos from Dale Dye and Rob Riggles. Cedric the Entertainer and Taraji P. Henson have supporting roles as do Wilder Valderrama, Pam Grier, Bryan Cranston, a great part for George Takai, and a breakout performance by Larry's new college buddy, Talia, as played by Gugu Mbatha-Raw. Heck, even Vardalas has a cameo (in voice only), her hubby Ian Gomez, and Hanks' wife Rita Wilson show up. I bet this film was a blast to shoot! Once Larry loses his job, we learn quickly that he is a divorcee, and with no job and no job prospects, he is in loads of trouble with his mortgage. Fortunately, he doesn't rally up some old Navy buddies and start robbing banks...that's an entirely different film altogether...maybe for Larry Crowne 2: The Revenge. Larry doesn't fold...he enrolls in school and takes positive steps towards improving his future. The tone of the film is lighthearted and the message is positive. There is but one carefully placed F-bomb kept this flick well within the confines of a PG-13 rating, which is good because it is wholly enjoyable for just about any moviegoer. At 99 minutes, this movies exists for just long enough to be a great time, then...cue credits. The movie would be much more mundane with a lesser cast, but fortunately Hanks has plenty of friends in high places and fortunately also, we end up with the film that was delivered. Crowne's adventure through a semester of college is steeped in many more ups than downs. The romance angle is subtle and the various bits through the movie play out as a well-written sequence of events that present a complete and enjoyable film. 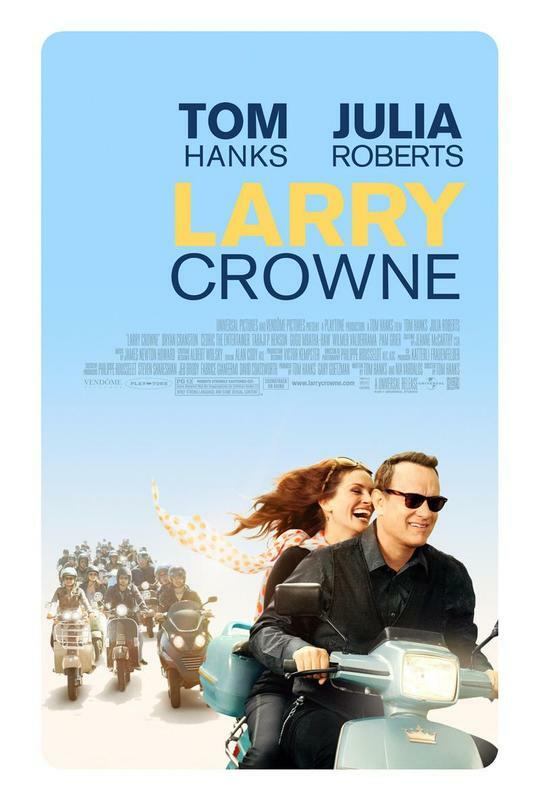 With another cast, I may have given Larry Crowne a 3.5, but it was just such an enjoyable time in the theater, I couldn't help but bump up to a 4 of 5 Horn rating. Check this flick out...you won't be upset is you do. I promise, this is the anti-blockbuster summer flick loaded with a blockbuster cast. And it is further proof that I can refine my palate to more adult content, even if it is a load of fun. Happy 4th of July to all those celebrating...to those in other parts of the world...Happy Monday.